​It’s the kind of diagnosis every parent dreads. A mutation on the SCN8A gene. But what does this mean? As all babies grow cell by cell in their mother's womb they develop small changes from their parents' genes. These changes happen by chance. Some are harmless, some are beneficial, and some cause diseases. 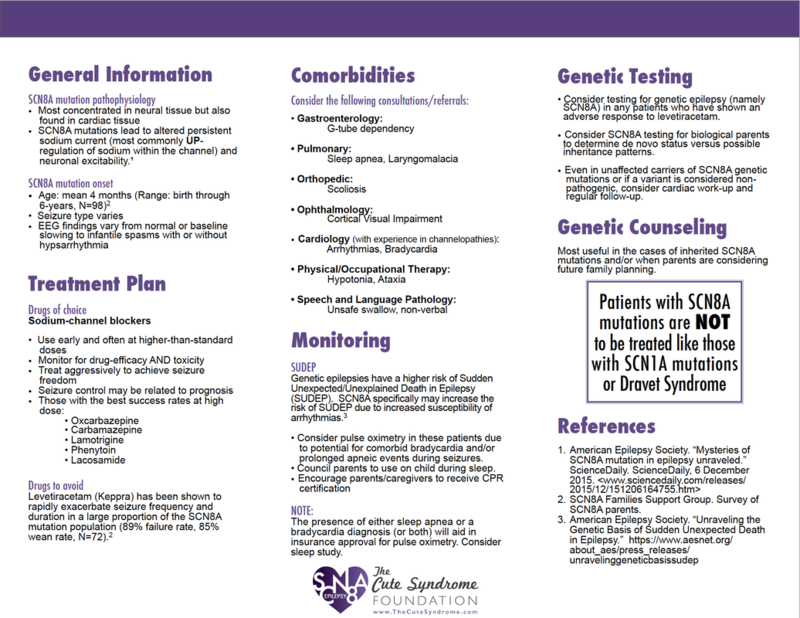 SCN8A mutations are the disease-causing kind. One letter is out of place in a string of billions of letters. Such a tiny change, but so devastating. The mutation causes severe epilepsy that is hard to treat. 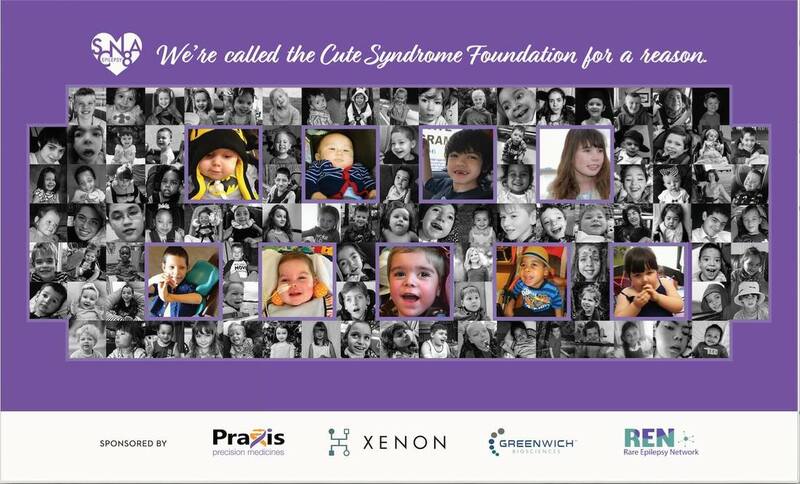 It's likely that children affected by this disorder will always have seizures and will be challenged by physical and intellectual disability. There is currently no effective treatment, and the disorder will affect these children throughout their lives. Every child with this condition is affected differently and with varying severity. A treatment that helps one child can make another’s condition worse. Doctors don’t yet understand why this happens, so choosing medications is a process of trial and error. Children can be left without seizure control for long periods, which can a lifelong impact on their development. SCN8A Epilepsy is a rare disorder that is known to affect around 300 individuals worldwide--causing severe epilepsy, developmental delay, and other medical challenges. SCN8A is a gene that affects how brain cells function. Mutations on this gene can cause neurological problems including epilepsy and learning difficulties. The role of SCN8A in the human brain was discovered in 2010. Since then, ~300 patients have been diagnosed with SCN8A epilepsy. Due to advances in genetic testing, more patients are being discovered all the time. It is now believed that SCN8A mutations may cause up to 1% of all epilepsies. What problems do SCN8A mutations cause? Most children with SCN8A mutations have epilepsy that is resistant to treatment - they may have seizures every day and need to be hospitalized often. Other symptoms include learning difficulties, muscle spasms, low or high muscle tone, poor coordination, developmental delay, and features similar to autism. The extent of physical disability leaves some children able to make little or no voluntary movement. Most children will have trouble learning to speak, and some will need assistance from feeding tubes to get the nourishment they need to grow. Seizures in SCN8A Epilepsy typically onset between 0-18 months, at a mean age of 5 months. Seizures in SCN8A Epilepsy are often refractory-- tonic-clonic seizures are the most typical, myoclonic and absence seizures are also common. Children with SCN8A Epilepsy often have some degree of developmental delay which may occur from birth or onset with seizures. About half of those with SCN8A Epilepsy have intellectual disability. Many others also have autistic-like features, hypotonia, and movement disorders--including dystonia and choreoathetosis. 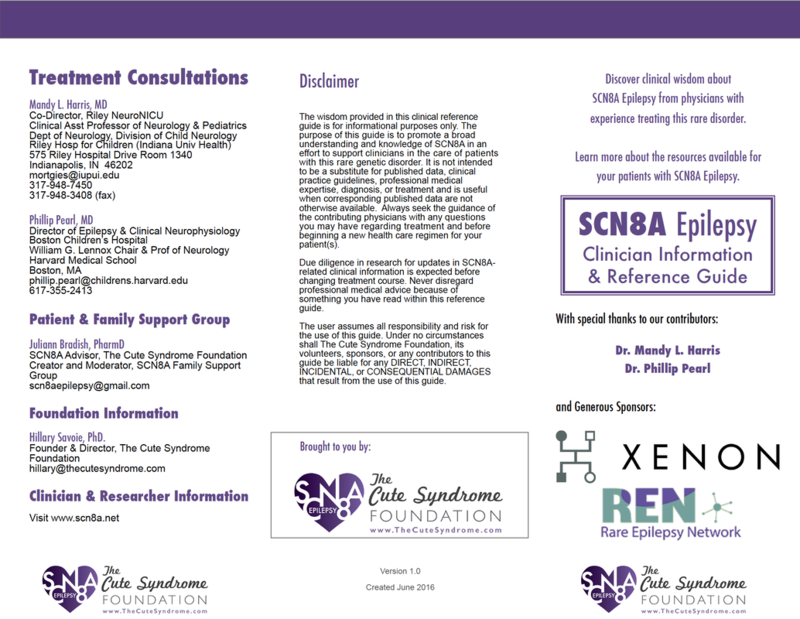 SCN8A Clinician Information and Reference Guide -- Print your own! Join our support group by emailing us here.